Here's how you know how many solar panels you need: Top 10 solar provider’s tips - Florida Power Services "The Solar Power Company"
On average, in the United States, residential homes need about 20 solar panels. However, that number can range anywhere from eight to over 50. It will depend on factors such as your electricity usage, the environment where the system will be installed, and the size and orientation of your roof. In order to find a more accurate response, let’s start by figuring out how much solar power you need. Be the energy police for a month. Start tracking how many kWh you use per month, and try to reduce this number by turning off lights, buying energy efficient appliances, and making other energy-conscious decisions to acknowledge how much you could potentially save on electric power. Once that’s off the list, figuring out how many solar panels you need to offset that number is easier to calculate. This will also help you better understand the cost savings and payback of going solar. 2. How many kWh can your solar panels produce? The amount of power (kWh) your solar energy system can produce depends on how much sunlight exposure your roof receives. Lucky for you, Florida is called the Sunshine State! However, if you live in an area that gets less sun, you’ll probably just need to have a larger system installed at your home. Solar Irradiance – It measures in kWh per meter how strong the sunlight is where the panels will be installed. Equipment Inefficiency – Inverters, wiring, and wiring junctions aren’t 100% efficient and a small amount of electricity is lost from the moment the electricity is created by the panel to it going to your house for use. No worries! At Florida Power Services, we monitor your system. The age and dirtiness of the panel – As solar panels age or become dirty, they become less efficient. Weather – Cloud, storms, and haziness can block sunlight from directly hitting solar panels. Even though these small factors decrease the efficiency of the system, when sizing your solar system, these inefficiencies are taken into account by your solar company and your system is sized to cover those losses. Our professional and certified solar contractors do by hand and with programs used by Florida Power Services to calculate exactly what you need. With your address we can estimate the local irradiance levels and weather, and determine how much electricity the system will produce. 4. Want to know the number of solar panels that you need? For every four solar panels installed, expect 100-150 kWh/month solar energy production when installed in a location with full sun. 5. Does your roof affect the quantity of solar panels? Let’s be straight forward: Yes. There are a few other considerations that can affect the size of your solar system such as the shading, size or orientation of the roof. Limitations brought on by the customer’s roof is one of the most reason homeowners aren’t able to cover 100% of their energy use. All the panels are interconnected and most inverters treat the group of panels as one large panel. Hence, if there’s shade on only a couple of panels, generation for the whole framework can drop significantly. This is why it’s better to avoid shade when possible. If there’s shading in a small section of the roof, the installer can simply avoid that specific section. Your solar power must meet your needs. This is way it’s extremely important to have your installation done by a State Certified Solar Contractor with years of experience in solar power in the state of Florida. The roof’s orientation also affects the number of solar panels needed. Install your solar panels on the sunniest location on your property for maximum energy production and savings. In the United States, the best orientation for solar panels is due south and at a 90-degree angle to the sun. As you move further away from south (facing east or west), energy production decreases. We understand that you can’t change the direction your roof faces, if you don’t have a south-facing roof, it’s better to install on east and west-facing roofs than not installing them at all. Also, Modern solar panels that are rated from 250 watts to 330 watts each, take up about three feet by five feet of space (or 15 square feet per panel). If you need more space for panels, use the east or west side of your roof as well. Panels are installed a few inches above the roof line to allow the air to flow between the roof and solar panel, allowing to keep things operating cool and efficiently. What a better way to understand exactly what you need and to get the right pricing on a solar power system that meets your specific needs than to get a personalized quote? At Florida Power Services, we are more than glad to be able to serve you with our excellent customer support and group of certified solar contractors. Click here to get a quote. If you’re going to invest on a solar system, be sure to get the right equipment. At Florida Power Services, we work with Solar World Panel. They are backed by over 40 years of solar manufacturing experience – the longest track record in the industry. Also, they offer mono cells, anti reflective glass, self- cleaning, reinforced frames, +5 watts power sorting, and a 25 year linear power output guarantee. Always remember that every home is unique, so the pricing will vary on different factors. We have the greatest attention to detail and aesthetics in the market. 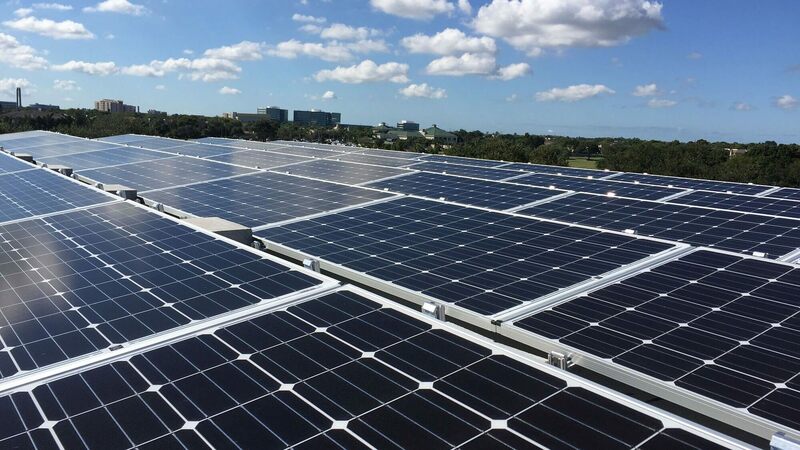 If you are looking for a solar power company near Tampa Bay, we highly encourage you to contact us to receive a quote that better adapts to your needs.